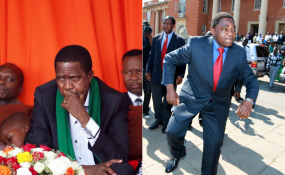 President Edgar Lungu and opposition leader Hakainde Hichilema (file photo). Zambia's opposition leader has pleaded not guilty to treason charges, four months after his arrest for failing to make way for President Edgar Lungu's motorcade. Hakainde Hichilema, who was first charged with treason for allegedly putting Lungu's life in danger and later accused of plotting to overthrow the government, appeared in a Lusaka court on Monday. The case stoked political tensions in Zambia after Hichilema and five others were arrested in April. All six "denied the charge of treason and the state has decided to take the matter to Wednesday for trial," said Charles Kakoma, the spokesman for Hichilema's United Party for National Development (UPND). He also said that Hichilema, who remained in custody, appeared in good health at the brief hearing. Police officers in riot gear sealed off the court precinct as scores of UPND supporters waited outside. Amnesty International has said the treason charges are trumped up and called for his release, as have local church leaders. A lawyer from UPND earlier told the AFP news agency that the party expected the charges to be dropped and for Hichilema to walk free.